The lies and pretenses surrounding today's use of the terms "public land" and "private property" are surfacing in an unexpected place: Windsor. It's an area to the West of London, best known for its castle where the Queen sometimes lives, and one gets an excellent view of her estate from above, should one land at Heathrow Airport against an Easterly wind. Prevailing winds, however, protect her privacy by respectfully blowing the other way. Windsor has some of the priciest real estate in Britain, and one mansion owner there is Sir Elton John, who last weekend was reported as pondering, with his neighbors, what to do about a proposed encampment of gypsies. The problem is that some land abutting his has been bought by Mr Maurice Sines, a successful developer with "romany heritage." His plans would place some of the poorest families in the country right next to some of the richest and snottiest. As one of Elton's neighbors put it, "Everybody has got to have a place to live but if they could only live in a civilised manner and pay taxes like everyone else in the village..." A truly classic case of NIMBY: Not In My Back Yard. And notice another delusion: that living in a civilized manner has to do with paying [property] tax. In this case, those taxes may be set high purposely to exclude hoi polloi. Her Majesty's opinion is not known, but I predict that if Sines goes ahead, he will never be known as Sir Maurice. Gypsies, a.k.a. Romany people, have a long history and originated in Northern India, migrating through Romania to most of Europe. That origin marks them as coming from one of the very oldest civilizations on Earth. Their main problem is that they don't care to settle down, and so practice a "deviant lifestyle" in caravans parked often in "public" places like roadsides, and - as the Windsor lady objected - not paying a serf's tribute to the government. I've heard of a few Americans who are living these days out of RVs rather than pay such tribute. Perhaps Gypsies know something we've forgotten. They seldom beg; they trade with the above-ground world, making artefacts to sell in open-air markets, or bartering for supplies. Police across the Continent routinely make the Romanys move on, in case they choose to stay more than a few days in one place (the movie Chocolat portrayed a delightful example) but it's hard for governments to craft a law to eliminate them from society. The Nazis tried, by gassing a quarter million of them to death, but other administrations have been more squeamish; last year Sarkozy in France tried to expel them but backed down. Now the village of Windsor has to deal with the problem. Whether they use "public land," or especially here, when they would park on Mr Sines' camp ground, what harm do they do? 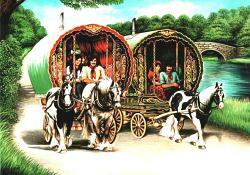 - and how does one distinguish in law between a regular caravan or RV, and a Romany caravan? When the coming zero government society has arrived, the problem will disappear. Every roadside will be owned by somebody - there will be no such thing as "public" land - so the owner will be free to make a little extra money by renting space to all caravanners on any terms they both find agreeable - just as Mr Sines intends to do, on his field next to Sir Elton's. And as for prop-tax, they will be found only in history books about the dark ages of government, so it's rather probable that the long hostility of regular folk towards Gypsies will fade away.